They arrived at Real Madrid almost at the same time. For three long years, they fought a hard struggle for a place in a starting eleven that only had room for one. On Wednesday night, the two will coincide on the pitch, but they will do so by defending different colours. 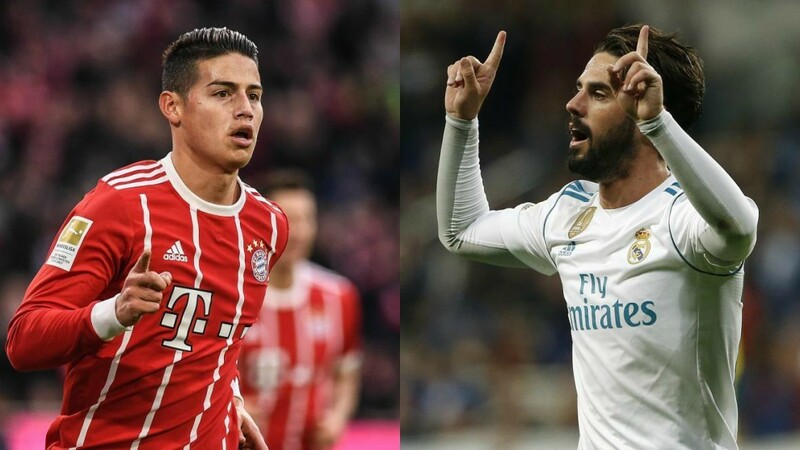 Isco and James, James and Isco, will fight one more chapter of an old rivalry in the Allianz Arena. First with Carlo Ancelotti, then with Rafa Benitez and finally with Zinedine Zidane, the constant duel between the pair ended with the triumph of the Spaniard in the 2017 Champions League final in Cardiff. James had to pack his bags and get out, but fate saw to it that he didn’t end up in too bad a place. Bayern Munich are one of the few teams that can face Real as equals. Isco and James in Madrid had certain parallels. The two came to the club arousing great expectation. James had a wonderful World Cup in Brazil and Isco was the leader of a super Spain U21 side, but neither of them had it easy. They both encountered the same problem: BBC. A non-negotiable front three for Ancelotti and for Zidane, until not long ago. Together with the untouchable Kroos and Modric, it barely left a free place in the team. James put up a fight, especially in the first year, and at that moment, the Colombian seemed ahead of Isco. It was also the politically correct issue from the institutional level of the club: 80 million euros had been spent and the club simply had to get its moneys worth. One factor that contributed to gradually balancing the issue in favour of Isco was that James suffered muscle problems with some frequency. Almost never very serious, but enough to lose a game or two here and there, he was up against a footballer who seemed immune to physical problems. In spite of everything, both were overlooked by Benitez in favour of Casemiro. In that second season, the numbers of both suffered. Often interchangeable, neither could build up a head of steam in the starting XI and the situation didn’t change with the arrival of Zidane. Now, the two talents do battle again.